If you haven’t owned a motorcycle, you probably won’t understand how crawling underneath to change oil or do some repairs can get uncomfortable. 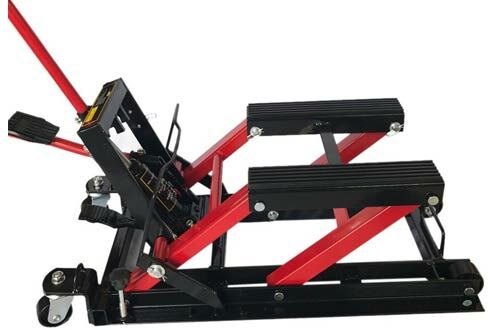 However, if you own one, you will appreciate the convenience associated with the strong motorcycle lift jacks, be it in regard to reducing costs or boosting comfort. These sturdy structures may lack the sophistication of most equipment but they make it extremely easy and comfortable to get under the hog and do repairs. Having your motorcycle elevated several feet off the ground gives you ample space to work on any part. Motorcycles have been gaining popularity over the past years and so are the lift jacks. You may think you won’t need one but it is just a matter of time before you do. Remember, your four-wheel vehicle won’t solve all your problems. Most importantly, not the priciest products prove to be the most reliable in the long-run. There are those that are fairly priced yet prove to be the best bang for the bucks! 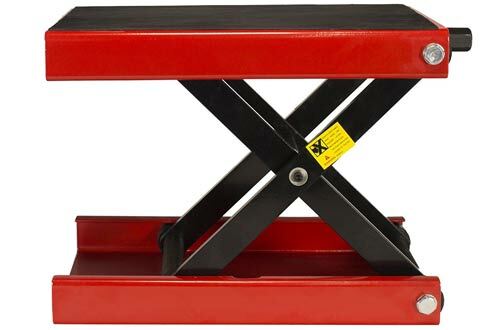 To help you out, we have compiled a list of the top Best Motorcycle Lift Jacks. The Orion Scissor Lift Jack for Motorcycle is one of the best sturdy elevating structures you will want to lay your hands on. Designed for cruisers, adventure touring and street bikes, this lift jack accommodates anything whose maximum weight is 1000 lbs. Heavy-duty steel construction provides you with the confidence you need when underneath the hog. Using the Orion Scissor Lift jack is pretty simple, not even the novice gets any trouble. It is also easy to clean due to oil-, grease- and dirt-resistant surface. The lift range of 3-3/4 inches to 13-2/5 inches provides versatility for any mechanical needs. Remember, this lift jack is suitable for bikes with a flat bottom and not ideal with UTV & ATV or snowmobile. Do not also use an impact wrench lest you risk destroying the nut. To operate this lift jack, simply rotate the metal sleeve to elevate your motorcycle. 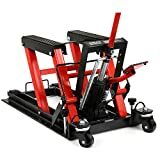 Good news is, you got a whole 1-year warranty to see Orion Motor Tech-Dilated Scissor Lift Jack stand the test of time. I highly recommend it to any adventurous tourist. The Liftmaster 1100-LB provides another convenient and versatile way to get underneath and fix your motorcycle. This device comes with safety pins that can be fitted in 6 different positions fully securing your bike plus preventing any accidental drops. Needless to say, a motorcycle landing on you when you are busy down there is not the prettiest news ever! 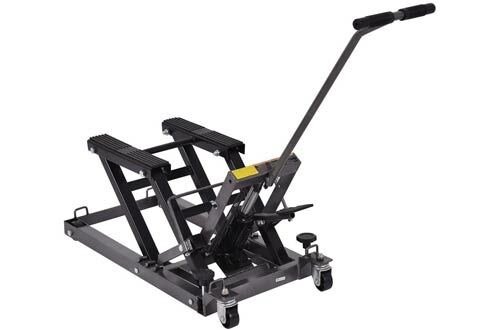 Center-lifting plus the 1100 lbs weight capacity allows you to use quite a variety of bikes on this lift jack. Additionally, 2 screw adapters are included to permit height adjustment. Without using the saddles or the adapters, this device has a lifting range of 3.5” up to 15 ¾”. Note that this lift jack is not suitable for bikes with exhaust pipes running under the engine. 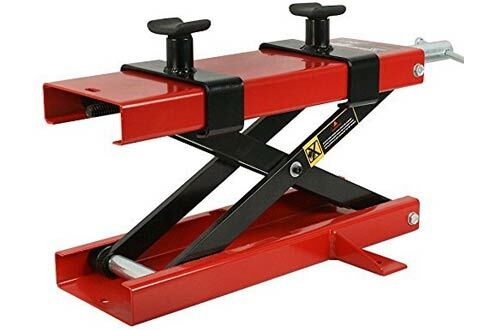 Overall, the Liftmaster 1100-LB is a simple crank-operated motorcycle lift jack highly recommendable to any bike owner in town. I love it! If you want a high-end professional motorcycle lift jack that will handle almost anything that comes along its way, the Smartxchoices 1500lbs lift jack is the ideal choice. Unlike other regular lift jacks, Smartxchoices boasts of several robust features that boost functionality and versatility. Tubular frames are made of high-grade steel while the entire structure is reinforced with a lead-free long-lasting paint to prevent rust. It is also among the few lift jacks with CE/ANSI certification in regard to machinery and product safety. Swivel casters allow users to easily move and transport this device. Moreover, user manual, handle, two adapter bars, and two tie-down straps are included to enhance operational efficiency. Featuring a weight capacity of 1500 lbs plus the 3 lockable lift heights, this lift jack accommodates a variety of motorcycles. Whether you are a fan of snowmobiles, ATVs, tractors, motorcycles, personal watercraft, Smartxchoices is always ready! This is another impressive lift jack that will make you want to take care of your bike every single day. It is an exceptional model featuring a weight capacity of 1500 pounds. Heavy-duty steel construction enhances durability and safety as well. You will get to any part of the hog knowing all is well. Just like other models, it also has swivel casters that ease relocation and transportation. Safety measures are well put in place owing to its multiple locking positions and the T-handles that provides a secure grip. To ease accessibility, Goplus ATV hydraulic Lift Jack elevates up to 17 3/8” off the ground. Moreover, a manual, jack, two adapter bars, and a handle are included. Grab this lift jack and give your ATVs, jet skis or dirt bike a special treat, it is worth your energy and time! 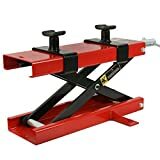 You may want to make a little addition to your garage by introducing the ZENY 1100 lbs Motorcycle Lift Jack. It provides a convenient way to always maintain your bike in a seamless manner. To boost height variance, this unit comes with screw adapters. Depending on your personal needs, you can achieve a minimum height of 3.25” and 13.25” at maximum with this device. It is one of the best yet simple crank-operated lift jack. I love the fact that versatility is well incorporated in this device, you can use it on almost any motorcycle model. High-grade solid steel construction boosts both performance and durability. Black or red powder coating delivers an appealing finish to this scissor centre-lift jack. Another prominent feature worth mentioning is the rubber mat that boosts stability. Overall, it provides the ultimate solution to those tired of always taking their bike to the nearest repair centre. 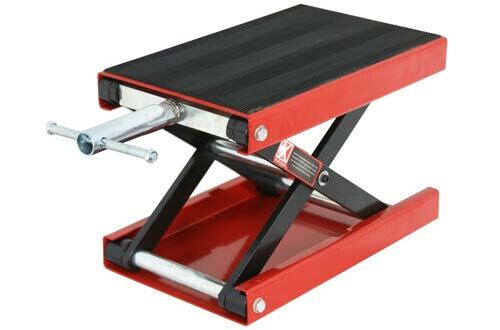 The 1500 LB Motorcycle Bike Lift Jack Stand is the perfect equipment for having your bike repaired at home. Designed with a lift capacity of 1500 pounds, this structure will elevate several motorcycle models making your repairs a breeze. It employs easy foot-pedal technology for lifting bikes and has a range of 4.5” up to 14.7”. High-strength steel gives this device a solid construction. To improve stability and safety, the 1500 LB Motorcycle/ATV Lift Jack has adjustable locking screws. Want to play with heights and role easily? Well, this unit also has four casters that will enable you to adjust the lift in different positions. Moreover, casters ease the transportation and storage of any motorcycle lift jack. Generally, this is a responsive all-in-one lift jack ideal for snowmobiles, personal watercraft, tractors, ATVs, and motorcycles. Sometimes all you need is a motorcycle lift jack that got the muscle you personally lack. Well, why not try out the Extreme Max 5001.5044 Wide Scissor jack. Words cannot describe how reliable this tool is, you better see it for yourself. It boasts of 1100 lbs weight capacity which is within the appropriate range. Engineered for centre-lifting, this lift jack can extend up to a height of 14”. Durable rubber padding provides the stability we all need when underneath working things down there. Moreover, the heavy-duty steel construction gives Extreme the desired solid feel. You will need a separately sold 7/8” socket to manually lower or raise your bike. Do not use an impact-style wrench on this lift jack, it can destroy the nut. Bike enthusiasts describe Extreme Max 5001.5044 as a way of life simply because maintaining your bike has never been easier with this lift jack. It is highly recommended to bike owners. Perfect bang for the bucks! Are you tired of your old lift jack that has a terrible narrow design? 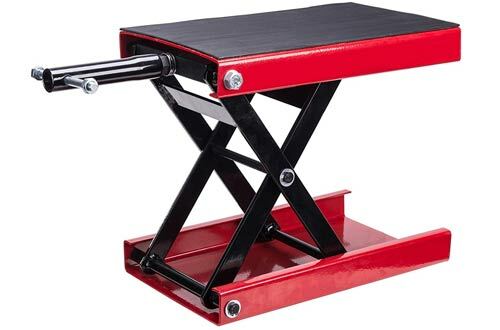 Well, you can say bye to the past by grabbing the ZENY 1500 LB Motorcycle/ATV Jack Stand. In a nutshell, this is a tool designed to make your bike maintenance easier than ever before. Made of high-strength steel, this device will lift anything whose weight is up to 1500 lbs. It is suitable for use with snowmobiles, personal watercraft, ATVs, motorcycles, and tractors. The best thing is, you can manoeuvre through the 3-lockable positions as you adjust the height between 4.53” to 14.76” during maintenance. Moving, positioning and even transporting the ZENY 1500 LB has never been easier owing to its swivel casters. In addition to the jack, this unit comes with a manual, two adapter bars, a handle and two tie-down straps. A motorcycle, despite being very convenient for a few rides here and there, requires regular maintenance. 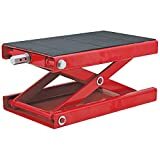 Well, you don’t have to break the banks every time you plan to change oil, clean up and do some minor repairs, you can be a perfect DIYer provided you grab the 1100-LB Wide Deck Motorcycle Scissor Lift Jack. It is the perfect tool for maintaining your brand new bike in your track, garage or shop. 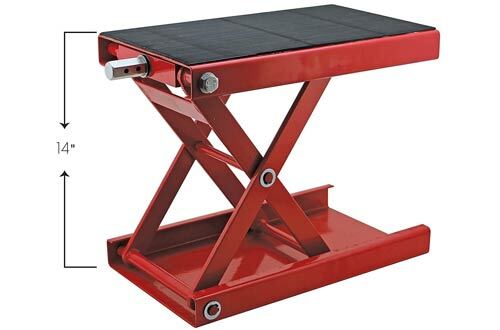 Featuring a wide platform of 16”×10”, this device can elevate your bike off the ground to a height of 13.25”. Hate those scratches that are left on your bike every time you use an old narrow lift jack? Worry not because that is well-taken care by the rubber mat included in the 1100-LB Wide Deck. Good news is, the 1100-LB Wide Deck Jack can be used with trikes, ATVs, cruisers, Can-Am Spyders and many more. Hands down, ZENY 1100-LB is one of the best centre jack lift any motorcycle owner would love to lay hands on. It is packed with several desirable features so as to make your repairs and maintenance a breeze. This easy-to-use lift jack features a solid construction, exactly what you need to get under the hog worry-free. It includes both a rubber mat and a textured rubber padding, both of which boost stability. 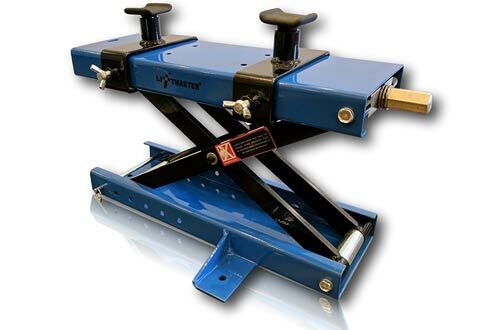 Scratches and slippages have no place in your garage if you own this high-end lift jack. Love a versatile tool? Well, the ZENY 1100-LB delivers exactly that owing to its two variable screw adapters. It can be used with sports bikes, Can-Am Spyder, Choppers, and Cruisers. Featuring a weight capacity of 1100 lbs and a lifting range of 3.5”-17”, this device is quite accommodative. You won’t regret owning the ZENY Scissor lift jack. Overall, this is a simple crank-operated motorcycle lift jack that deserves a place of honour in your garage, shop or track. The use of motorcycles is becoming more popular across the globe. The number of brand and models are increasing in the market. Because of their technicalities in their functionality and performance, motorcycles require frequent servicing to prevent malfunction as well as identify any concerns before it is too late. In addition, servicing your motorcycle is important to ensure it runs smoothly. 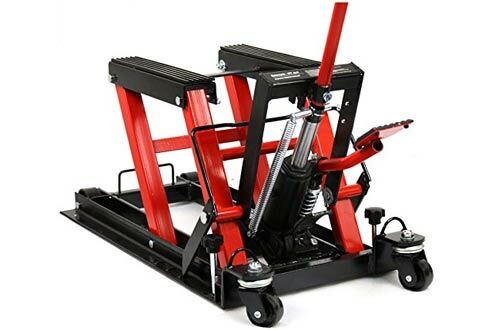 In an effort to ensure you can easily service your motorcycle, the idea of purchasing motorcycle lift jacks is important. With the help of motorcycle lift jacks, motorcycle maintenance is made easy. There are different motorcycle jack brands and models in the market and it is important that you choose one that will suit your needs and preferences. They come with varying features to meet the different needs and preferences. 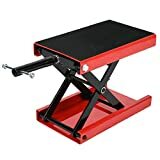 If you are looking to purchase one for yourself, the following are the top best motorcycle jacks for sale reviews that will help you settle for one. This lift jack is convenient as it is designed to work with many of the motorcycle models. This makes it ideal for individuals who own more than one motorcycle model. It comes with a scissor jack that is easy to use without a hassle even for beginners. 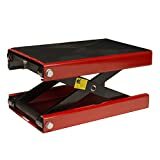 Its lifting platform is made of rubber, which serves the purpose of promoting its quality as well as ensuring that it promotes stability when working on your motorcycle. In addition, the mat on the platform prevents the risk of slipping as well as scratches to the motorcycle frame. Its height variance ranges between 3.2” and 13.25” and holds a maximum of 1100 lbs. This device offers a center lift for motorcycles, which allows for ease in accessing all parts thus promoting easy maintenance. It comes with a maximum capacity of 1100 lb motorcycle weight. Its rubber-padded platform promotes stability and ensures a firm grip, which minimizes the risk of accidents. If you are looking for durability, it comes with a strong steel construction. It has a lift range of between 3.75 inches and 16.25 inches and it will support a maximum of 1,100 lb weight capacity. In an effort to boost on height variance, it comes with two removable frame adapters, which add 2inches and 3.25 inches of height. To use it, it is done manually and this makes it easy to use by right about anyone. It is designed to ensure durability thanks to its heavy-duty steel construction. To boost its functionality, it allows for both front and rear lifting of your motorcycle. This motorcycle comes with added features that are ideal to boost performance and functionality. These include the addition of the steel safety bar to help minimize the risk of accidents. While it offers a lifting range of between 3.5inches and 16inches without saddles and goes higher with saddles. It also comes with two adjustable saddle adapters. In addition, it has two heights adjustable rubber coated frame pads that ensure a firm grip as well as durability. The rubber coated frame pads ensure stability when working on your motorcycle. This model comes with a center lift for all types of motorcycles as long as it is not more than 1,100 lb weight capacity. 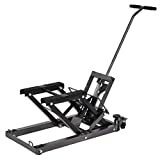 To ease on maneuverability, it comes with four steel caster wheels that are bolted directly to a dolly tray that will also come in handy in holding your tools. It is also durable as it is made of steel. 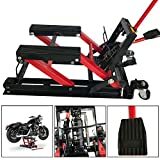 This motorcycle jack comes with a hydraulic scissor lift. In addition to the wheels, it provides the perfect jack for MX dirt bikes and quads ensuring that you can easily lift your motorcycle. In an effort to lift the stand, it comes with a foot pedal. To promote safety, it is installed with a safety pin and a safety loops that are also responsible for ensuring stability. It is designed to be durable with a heavy-duty steel frame construction. It can hold up to 300 lbs. To help enforce a firm grip, it comes with an oil and gas resistant rubber top. This motorcycle jack comes with a scissor center to ensure an easy to use jack for even a beginner to use. It can support from either the front or the rear. It is not only easy to use but it is also designed to ensure durability. This simple crack operated jack is simple to use as well as durable. 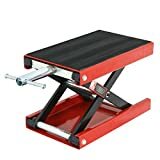 It comes with a lifting range of between 3 ¾ inches and 15 ¾ inches as long as the weight lift capacity does not surpass 1,100 lbs. It also comes with two saddles and two adapters with added features to help boost its functionality and performance. In an effort to ensure stability, it comes with a wide base with an extra-attached 3” wings on either side plus a scissor center. This motorcycle jack comes with a deluxe hydraulic ram, which provides an air operated foot pedal. To ease portability and maneuverability, it is equipped with dolly wheels. It is safe to use thanks to its multiple position safety lock mechanism. Its steel construction makes this jack durable to serve you in the long-term.